Popular for inspection, grinding and turning operations in maintenance, prototype and tooling shops. Initial cost low; delivery fast; largest sleeve sizes commercially available. Proven, rugged, simple design (T.I.R. 0.001"). Popular for grinding, inspection and close tolerance turning operations. Between center mounting. Two sleeve lengths available (T.I.R. 0.0005"). 0.015" sleeve and expansion on a given diameter. 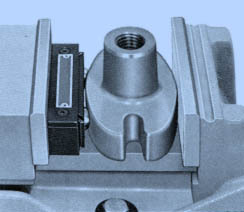 A nut-actuated, between center mandrel designed to simplify part loading/unloading, while providing the longest sleeve for maximum bore contact. 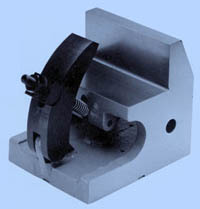 Snap ring groove provides part locator stop. Excellent for those production requirements where .0005" T.I.R. is needed. 0.015" sleeve and expansion on a given diameter. Between center mandrel to accomodate shorter bore lengths and light manufacturing operations (T.I.R. 0.001"). More mounting holes, larger flange and shorter overall length add user flexibility. 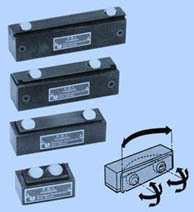 Nut or power drawbar actuation. Two sleeve styles available. F-N-800 operates manually; F-P-800 accepts only power drawbar. F-N-800 includes arbor, sleeve, drawbar, nut, washer; F-P-800 includes arbor, sleeve, drawbar, and washer. Two sleeve styles available. Unique six hole design accommodates both three and four hole mounting requirements.F-P-1800 accepts only power drawbar; F-N-1800 operates manually. 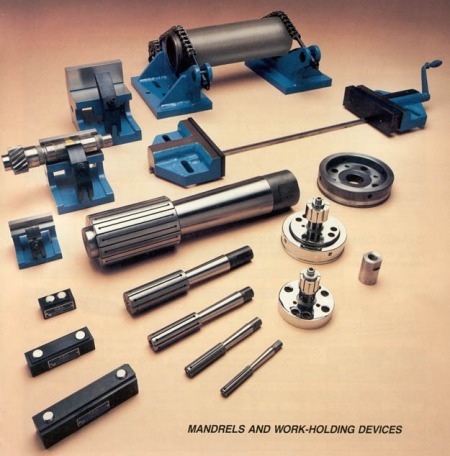 Both F-P-1800 and F-N-1800 Series Mandrels consist of arbor, sleeve, drawbar and washer. D-A-2800 Drawbar Adaptor allows one power drawbar to accommodate various mandrel size, simplifying setup. F-B-A-3800 Series Flat Back Adaptor permits easier 1800 mandrel set up through use of centering screws. P-L-4800 Part Locator helps position part economically and accurately on 1800 Series mandrels. Eliminates shims and fixtures for irregular, curved, or tapered work. Automatic compensation for irregular shapes. An essential investment for round, square, hexagonal, octagonal, or rectangular shafting. Key in fixture base aligns work with T slots in table. All working surfaces precision ground. Available in matched sets for longer work. Can be used vertically or horizontally. Comes in four sizes. 4" to 18" shaft capacity. Adjustable roller chain strap simplifies setup. Aligns work quickly with machine table. Sold in sets of two - total weight 100 pounds.